Take a look below for some movies you need to watch in your spare time! We ALL LOVE this Classic! In 1880s Australia when young Jim Craig’s father dies Jim takes a job at the Harrison cattle ranch and he is forced to become a man. – Nominated for 1 Golden Globe. The fates of horses, and the people who own and command them, are revealed as Black Beauty narrates the circle of his life. Such a beautiful story! This movie chronicles the life of the much-loved Australian racehorse Phar Lap, who raced to stardom in the 1930s, and the gentle groom who loved him. Despite having to carry increasing amounts of weight, the horse is unbeatable. Phar Lap’s tale ends tragically when he dies under mysterious circumstances soon after winning his most important race—the Agua Caliente Handicap in Mexico. The mother of a severely traumatized daughter after a riding accident, enlists the aid of a unique horse trainer to help the girl’s equally injured horse. When Velvet Brown, an equine-loving 12-year-old living in rural Sussex, becomes the owner of a rambunctious horse, she decides to train it for England’s Grand National race. Aided by former jockey Mi Taylor and encouraged by her family, the determined Velvet gets her steed, affectionately called “The Pie,” ready for the big day. However, a last-minute problem arises with the jockey and an unexpected rider must step in as a replacement. This sequel to “National Velvet” follows Sarah Brown, a young girl who is sent to England after her parents die in a car crash. There, she lives with her aunt Velvet who introduces Sarah to the world of equestrian competition and gives her the last foal of her own prize horse, The Pie. Under the watchful eye of her aunt and horse trainer Capt. Johnson, Sarah develops into a talented rider who might have a shot at the Olympics. Ken McLaughlin struggles to please his family in any way. He comes back from boarding school boasting poor grades and facing going through the fifth grade again, much to his fathers dismay. Ken’s mother, Nell, manages to persuade his father Rob to let him choose a colt from the herd for himself. He instead chooses a sorrel chestnut filly, who becomes injured soon after. Can Ken nurse the filly back to full health? Flicka, the beloved horse of young Ken McLaughlin, has given birth to a son. But instead of taking after the calm and collected Flicka, the colt, which Ken names Thunderhead, takes after his wild albino father. Despite Thunderhead’s wild streak and rebellious spirit, Ken and his father, Rob try to break the wild stallion and make it into a prized racing horse. But Thunderhead’s wild nature may by too much for either of them to tame. Enteroliths are stone-like formations in the colon of the horse that can cause obstruction and colic. Usually a build-up of struvite crystals made up of minerals, magnesium and phosphorous, they form around such strange materials as cloth, hair, gravel, metal, plastic and shavings. All breeds and genders can form Enteroliths, but Arabians and mares seem to be more prone to the condition. This is thought to be due to the presence of prostaglandins (fatty acids) in the serum (protein-rich liquid which separates out when blood changes to a solid ) leading to changes in gut movement. The crystals are laid down in concentric rings, and the larger the ring, the bigger the blockage. The rings usually start around a foreign body in the intestine, such as a small piece of cloth or hair that has been ingested. These rings can form into one large enterolith, or they can form into many small enteroliths in groups. If one large enterolith is formed, usually the horse will experience colic to varying degrees as the calculi gets stuck in areas of the large intestine, causing bloating and clogging to varying degrees. Love our blog posts? Check this out! What are the symptoms of an Enterolith? It is recommended to ensure that horses that have been affected by this condition are fed roughage that consists of at least 50% hay or grass. Alfalfa should preferably be eliminated from the diet. Reports suggest that cider vinegar added in to hard feed may help to prevent the formation of enteroliths. Also make sure that all foreign bodies are removed from the horse’s feed, such as bailing twine that has been left in the hay or on the ground. For further advice and knowledge on this condition have a look at these fantastic articles below! DISCLAIMER – we are not vets, so when you are unsure about your horse, call their health care professional. Your vet knows and understands the symptoms of Enterolithiasis and will be able to determine what treatment is required. Ignorance is NOT bliss… it’s dangerous! While some people might think this is cute or funny… I tend to agree with the majority of people that talk about the dangers of this behaviour. Yes – there are lots of videos online about peoples and foals cuddling, and the guy probably wanted his video to go viral just like the horse cuddle video from a few weeks ago. However – where this guy misses the boat is on basic horsemanship…and an obvious lack of knowledge in animal behaviour. Colts try this behaviour as it’s a normal way for them to figure out where their boundaries are.. and he might need this “skill” later in life as a stallion when he needs to mount his mares. But I think we can all agree that this is NOT the type of behaviour we want to encourage in a horse when it interacts with a human! Teaching a horse to rear up to you is not cute or smart and can lead to very dangerous situations! Can you imagine this horse doing this again when he is 2 or 3 years old? He was allowed to do it in 2015, so why not in 2018?? The horse will be very confused..
Not everybody goes through pony club, or has regular lessons at a reputable riding school to learn about horse behaviour or basic horsemanship before they get involved with horses. Looking at this video though, I’m thinking there should be some form of training for everybody involved with horses (like rider L-plates) what do you think?? Question: WHERE did you learn your basic horsemanship skills? There are only a few spots where the horse can see with both eyes – it’s the little triangle that is orange on the image below. The rest is only viewed with one eye at the time. 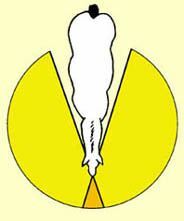 Which makes sense as the eyes are on each side of the head. Right underneath their nose is a blind spot. 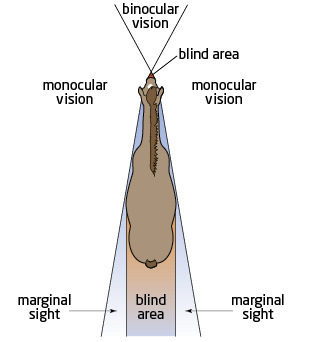 So your horse can’t actually see what you put in front of their nose – it could be a carrot or an apple stick …. or your finger! The Second blind spot is right behind them – which is why you have always been warned not to approach a horse from the back. Simple reason because they can’t see you and it will startle them when you suddenly touch them! 4. Does your horse see in colour? 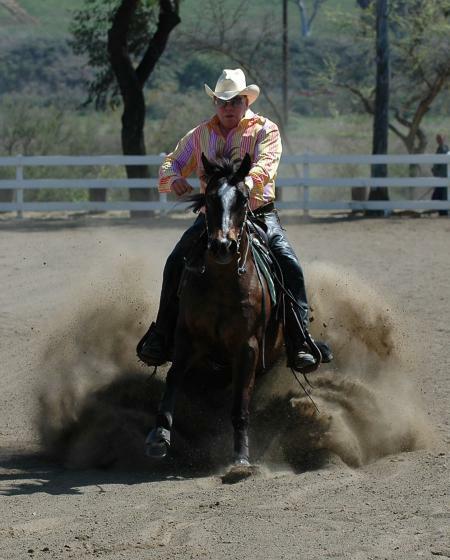 After decades of breeding and riding saddlebred horses, he now owns a Quarter horse and has taken up reining. Last year he appeared at the Comicon conference in a wheelchair after a riding accident left him with an injured leg. We’re sure that as soon as his leg healed, he was back in the saddle again. “I also derive a great deal of pleasure from horses and dogs… the ocean… and love,” William Shatner with his horse Kelvin. Who is going to watch the 2014 FEI World Equestrian Games in France? Mary Hanna is doing really well in Europe at the moment in preparation for the competitions. Read more about it … :Hanna on form in France. Today is the beginning of the rest of my riding career – and I promised myself to ride without stirrups at least 2 sessions each week. It wasn’t as elegant as I was hoping it would be, but at least I can feel my muscles had a massive workout! Below is a blog post with some hints & tips on riding without stirrups… enjoy! Riding without stirrups – Balanced Rider Blog. 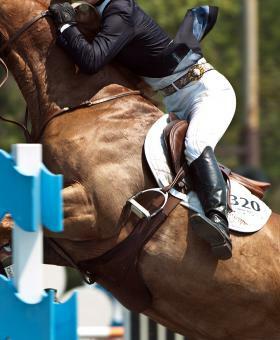 Ask The Experts: Why And How Should We Ride Without Stirrups? | The Chronicle of the Horse. Riding without stirrups is super important to create an independent seat. George Morris talks about the exercises to do when riding without stirrups. Q: At what level should a rider begin practicing without stirrups? A: In an ideal world, beginner riders should be started on a calm horse on the longe line without stirrups right from the start. These exercises benefit riders of all levels. In Germany, following the same concept of teaching a rider about seat, balance and independence, most children are started with vaulting as a complement to their riding careers. But riders of all ages and levels can start now to make riding without stirrups a habit and thereby improve their riding. Although horses are traditionally measured in hands, with Europeanisation horses are also measured in centimetres, particularly small ponies. The table below shows the conversion from hands to centimetres. via Horse Height HH (hands) And CM (centimetres) Conversion. Why is Hendra virus so dangerous? Hendra virus is not very contagious, however once your horse has been infected it’s very dangerous: Biosecurity Queensland says that mortality rate of Hendra virus is 80% in horses and 57% in humans. Can my horse get Hendra virus? How can I protect my horse from getting Hendra virus? While nothing is 100% effective, currently the best way to minimise the risk of your horse getting sick from Hendra virus is to vaccinate. Contact your vet for more information. Where can I learn more about Hendra virus? Biosecurity Queensland has a great website that is kept up to dat with the latest information about Hendra.